That is, until she is artfully maneuvered into meeting the mysterious and abundantly self-assured Grayson Kearney. A keen judge of character and cunning magus, Grayson rocks Zia’s world in more ways than one as he helps tear away the veil of ignorance from her eyes. From lifelong friends to sworn enemies, the new leader of the House of Locke is discovering that anyone could be the next to betray her. What Zia needs is a good intelligence officer at her side. But when everyone has a hidden agenda, can she truly place her trust in Grayson? Today’s Interview comes from Aine Massie, author of the House Millar series. 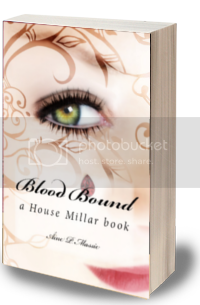 Blood Bound is the second book in the House Millar series and picks up shortly after Blood’s Voice. There is a return of the villain from BV plus a new one, but don’t let first impressions fool you on who it might be. You also get to learn more about Anya as well as see her explore her role as Mistress and leader of the House Millar. There’s a bonding, a wedding, more memories surface, and even in the end, it’s not the end. The wonderful Daryl Devoré stopped by today. Make sure you check out her interview below! Sold by her family to become a submissive courtesan to a powerful man, Branwyn arrives in a strange new land ruled by the castle of Black Dorn. Horrified by Branwyn’s lack of knowledge regarding relations between a man and his woman, her instructor, Duna Trea, begins her daily lesson in the art of bedding a man. A lovely young woman, I believe her name was Peony, led me out onto the veranda of the beautiful home that is the House Millar. The charming Mistress Anya was already waiting on me. She even though of my human needs – a snack and drink were laid out on the small table beside the empty chair. Once I was settled Anya offered me tea as I thanked her for this rare opportunity. You are quite welcome. I don’t mind speaking to others as long and they remember the rules. *wink* Though, you have to by default, being human and all. True. I’ll start off with an easy one. You’re a vampire? Yes. Though I’m an aberration in my world. I refuse to kill humans just to live. I am not fluffy though – so do not underestimate me or those you see that live here. We are lethal when we need to be but humans are off the diet. 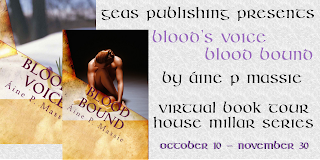 To see the entire Interview with Mistress Anya from Blood’s Voice by Áine P Massie, author of the House Millar series, visit Jeanz Book Read N Review by clicking on any banner or by clicking HERE. Make sure to leave comments… Jeanz loves to hear from you! Also, you can ask Anya questions and she’ll stop by to respond. he biggest complaints I get are about the GBLT and Triad relationships – won’t change those, period. The other is the non-American spelling in the books… but again, there is a reason for that. If the character telling the story had been American the spellings would have been too. (That and I naturally spell colour and centre, lol). 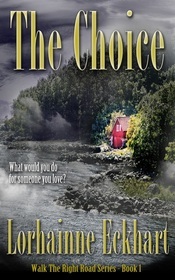 To see the entire Interview with Áine P Massie, author of the House Millar series, visit Jeanz Book Read N Review by clicking on any banner or by clicking HERE. Make sure to leave comments… Jeanz loves to hear from you! Hello one and all! Today we have special guest author, Áine P. Massie, dropping by Breaking Bookshelves and being awesome! She’s agreed to do this little interview here on Breaking Bookshelves just to inform us a little bit about her House Millar series~ So sit back, get some coffee or tea, and enjoy! That sounds very interesting! I’m guessing it was like getting to know completely new people! What made you decide to write mainly about vampires instead of some other mythological creature? Did you try to stick with original vampire lore? I have always been fascinated with vampires and the various incarnations, be it in books, comics, movies, etc. Vampires are not the only mythological creatures in the HM series, by the way. Book 3, Glamour Blade, is told from the POV of Sir Rory, a sidhe warrior sent to help the Guardians. As to original lore . . . Actually, you have to understand that there is no such thing as “original lore” for vampires. Each culture that has believed in blood drinking creatures has also had their own ideas of what those beings looked like, were hurt by, acted like . . . My vampires are day walkers (but technically so was Dracula is you read the old book carefully – it was possible for him to be out in the day), though the sun does weaken them to a nearly human endurance. They cannot eat but they drink if it’s mixed with fresh blood. Their fangs are retractable but when retracted, the eyeteeth are slightly pronounced. They have the currently common beauty and grace but they are allergic to silver. There are other things about them too but the key is that there is lore basis for each of the main traits my vampires have. No, they’re not Angel or Edward nor are they Dracula or Nick Knight but rather they are the unique, blood drinking beings that inhabit my story world. To see the entire Interview with Áine P Massie, author of the House Millar series, visit Breaking Bookshelves by clicking on any banner or by clicking HERE. Make sure to leave Demi comments . . . she loves to hear from you!